The water vapor image above essentially shows moisture in the upper-half of the troposphere. It illustrates the extent of the very large, middle level anticyclone that is centered over the Texas/Oklahoma Panhandles. Loops show the circulation extending from coast-to-coast. Most of the thunderstorm activity is located in the western half of the anticyclone. But at 06 UTC there were also strong storms in the Tennessee River Basin; MCSs in Colorado, Kansas and Nebraska; and also western Mexico. Strong storms occurred over the lower Colorado River Basin and southern California yesterday afternoon. Much of the central US will be very hot again today, with 100+ readings centered on Oklahoma and north Texas. Note that an area of storms moved into Cochise County from Mexico late yesterday afternoon and moved north-northwestward to the east of Tucson. These storms were associated with a weakening, upper-level cyclone/inverted trough. 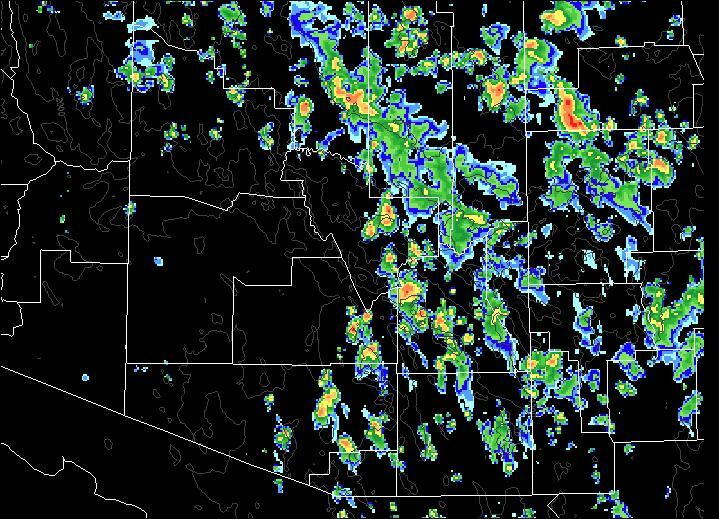 Tucson experienced an outflow from these storms around 11 pm to midnight last with east to southeast gusts of around 30 to 35 mph (57 mph at Atmo's roof anemometer). An area of light, anvil rains crossed portions of the metro area around the same time. Over the ALERT network 33% of the sites had rain. Amounts were very light and generally less than 1/10" - here at house there was 0.02" in the gauge this morning. The Tucson morning sounding (below) has PW of about 1.33" and minimal CAPE as per SPC analyses. The upper-level winds are chaotic this morning - due to the 500 mb inverted trough to the west and the decaying upper-level feature which is nearly overhead. The outflow left behind a fairly deep layer of cooling near the surface that is affecting the CAPE calculations. Another heavy storm in the metro area yesterday (Sunday, 29 July). This time the storm moved north across the east side of town, and then westward along the foothills of the Catainas. Photo above was taken looking toward the foothills at about 3 pm. Here at house we had thunder, outflows, and 0.25" from light showers as the echo core bypassed us to the north this time. Path of heaviest rains shows nicely on the two panels from the ALERT network (below) that give 24-hour rain ending this morning. 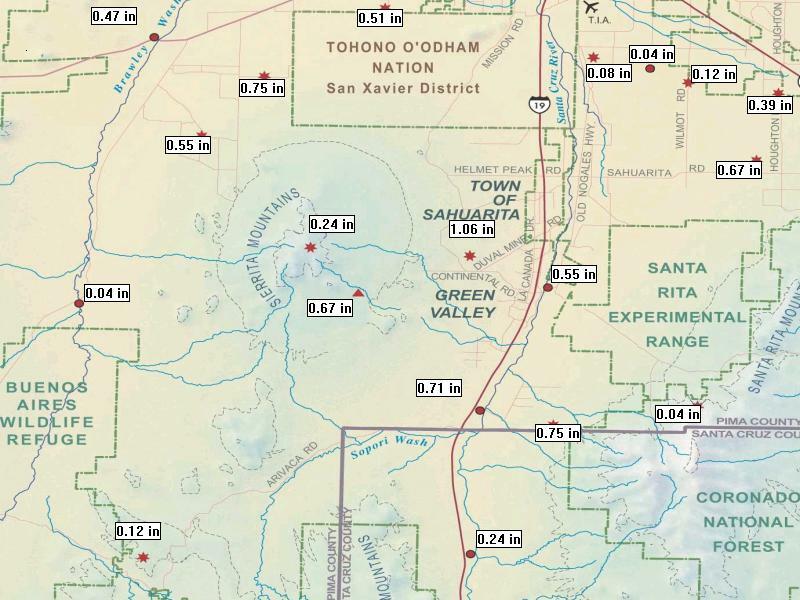 Across the entire network, 70% of the stations had rain yesterday - 22 sites had more than half an inch; 9 sites had more than an inch; and the station at Finger Rock and Skyline had 2.01" (photo above is centered about at Finger Rock). This morning the Tucson sounding (below) remains very moist and with strong south-southeasterly winds in middle levels. The 500 mb inverted trough is quite pronounced this morning over the western portion of Arizona. It is forecast to stagnate out there over the next three days. The sounding this morning actually has only a sliver of CAPE if boundary layer mixes out to about 750 mb. The early WRF-GFS forecasts a totally down day in the local area. Factors that lead to this dramatic downturn appear to be: weak subsidence and moisture divergence in lower levels, coupled with warm temperatures and some drier air from northern Mexico around 500 mb. WRF-GFS forecasts PW here at U of A to be down to around 1.30 inches at 5 pm this afternoon. It's hard to accept that there won't be some mountain storms around today - will watch to see what the new runs this morning do. 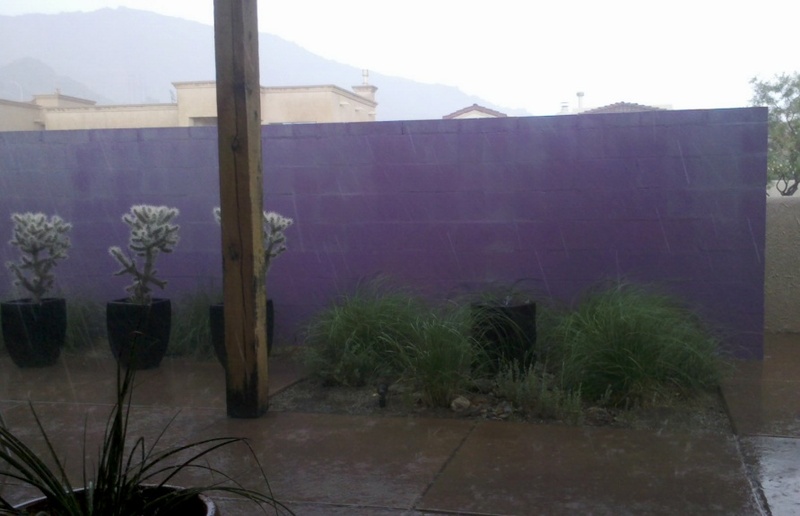 Strong storms with heavy rains moved across parts of the Tucson metro area at mid-afternoon yesterday. Regional radar at 3 pm MST shown above. Two subsections of the ALERT data for past 24-hours are shown below. The areal coverage of heavier rain amounts indicates two strong storms moving toward the west-northwest. One from the DM AFB (0.99") area out to Picture Rocks (2.01") and the second from the north end of the Santa Rita Mountains west across Green Valley. Rain fell at 65 of the ALERT stations (70% areal coverage) with 22 sites having more than a half inch and 4 stations with more than an inch. Here at the house we had only a few rumbles of thunder and another day with only a trace of rain. It remains very moist and moderately unstable across southeast Arizona. The day has started out with clear skies and sunshine for the first day in quite awhile. 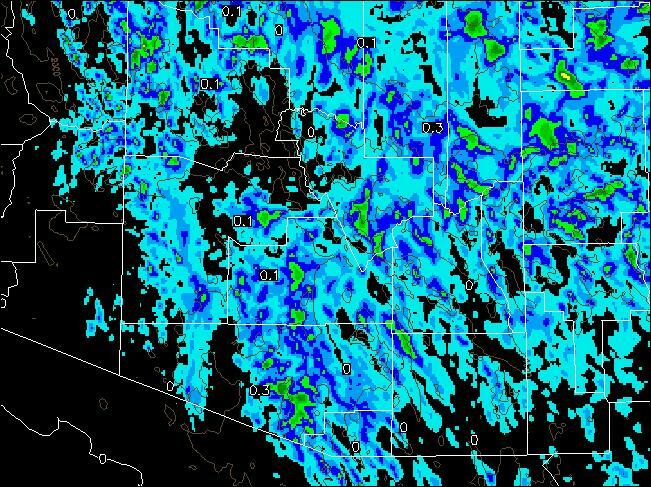 The early WRF-GFS forecast of PW at 5 pm MST (above) this afternoon (29 July 2012) shows values near and over 50 mm (~ 2 inches) across much of southern Arizona. 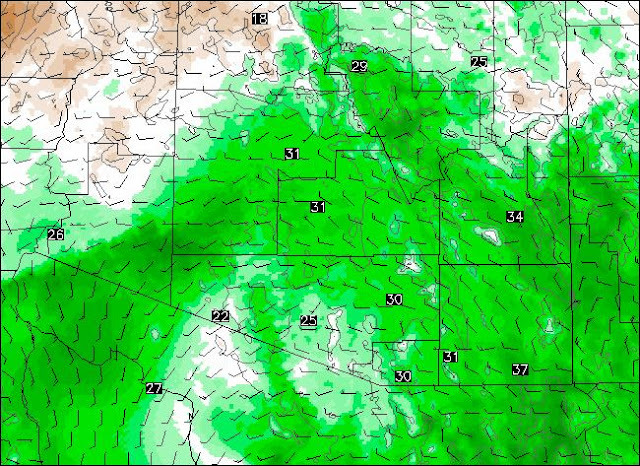 There appears to be a trailing portion of the 500 mb inverted trough that will swing across southeastern Arizona this afternoon and evening. Winds at 500 mb are forecast to be from the SE at around 25 kt by afternoon, so that storms should move more rapidly toward the northwest today. The upper-level winds are forecast to be light, so that storms will again have trailing anvils. 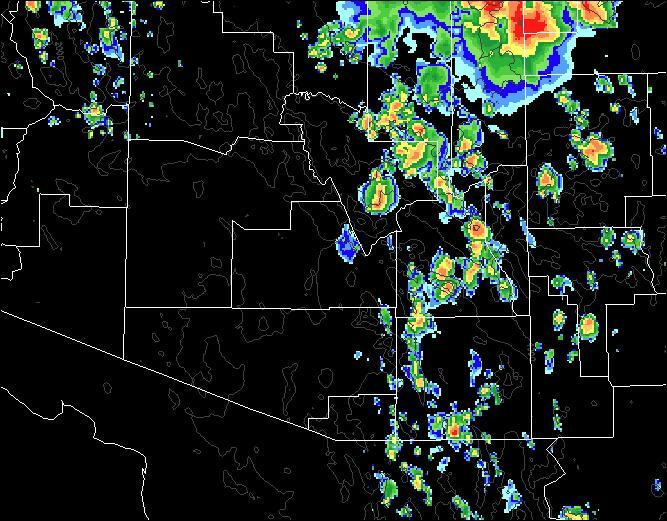 The models are keeping heavier storms in southeast Arizona again today. Potential for severe winds, mesoscale organization, and local heavy rains appears to be high today. WFR-GFS forecast of rain through midnight is shown below. Yesterday played out about as expected. 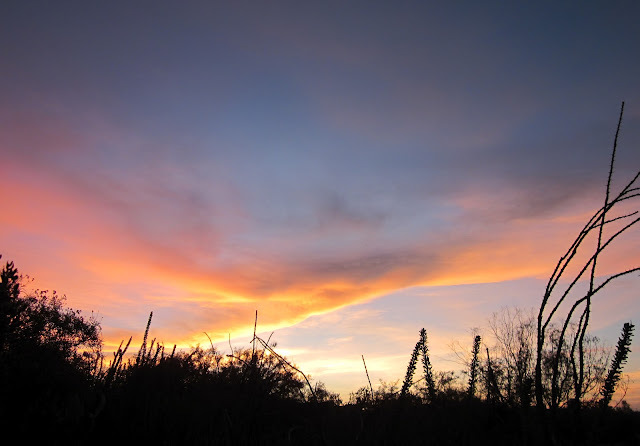 Afternoon and evening storms made it west to the Rincons and then decayed. 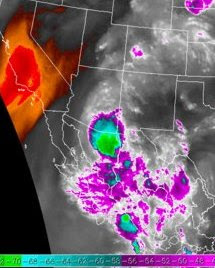 A large MCS in northeastern Sonora was the dominant feature during the night (04 UTC IR on 28th above). 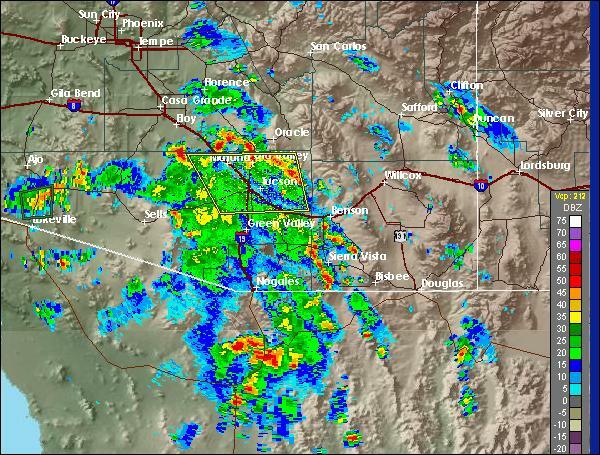 A strong outflow blew through the Tucson metro area from the decaying storms at around 8:30 pm MST. I estimated gusts here were 50+ mph. Light showers from the storm debris at house around midnight amounted to 0.04". Across the ALERT network about 45% of the stations recorded rain in past 24-hours. Amounts were generally ligh, with most rain up on the Rincons - no stations reported more than 0.39". So more wind than rain last night. The time series of T and Td from Atmo's roof (below) shows the dramatic first outflow and then indicates several additional small outflows during the night - each of these continued to increase Td. The GPS vs RAOB PW time series (above) shows two distinct jumps during the night, kicking PW up to about 1.75" this morning. So, with outflows and recycling, the Tucson area is now very moist. The far southwest part of Arizona has experienced sharp Td increases as convection affected the middle GoC, but PW remains low out there. This morning's Tucson sounding (below) indicates moderate CAPE. Winds aloft are still not great, but models forecast stronger, somewhat uni-directional winds this afternoon. 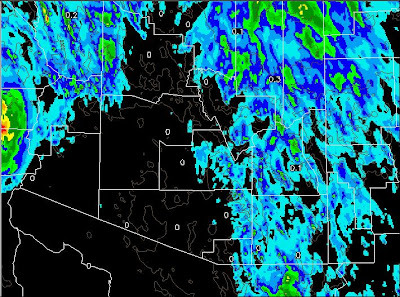 Weak inverted trough continues moving westward across Sonora and the Borderlands. The near-surface cooling was not great during the night and sunshine should break through in places and get storms going earlier today. Finally, large amounts of debris cloud reach from northwestern Mexico northward and northeastward across much of Arizona and Colorado. 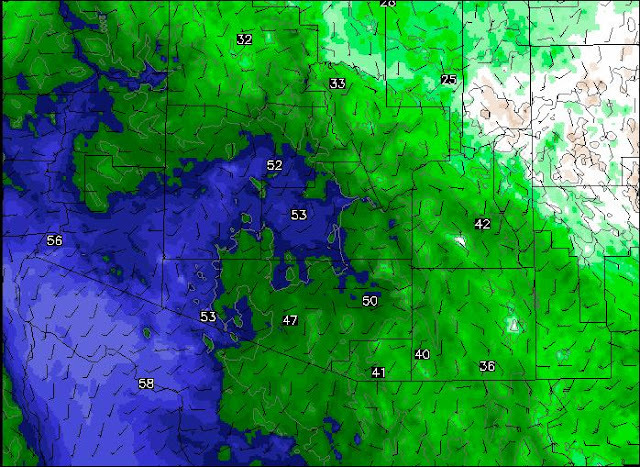 Thickest cloud cover appears to be across south-central Arizona. Both the WRF-GFS and NAM forecast numerous storms during the morning hours today and seem once again out sync with the timing of events. Threat of local heavy rains and microbursts is significant today. Yesterday was another down day here in eastern Pima County with no rain recorded in the ALERT network. There were storms over the mountains to the north and east. Significant outflows produced up there, but little additional development at lower elevations. 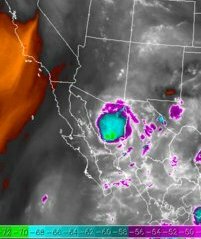 There were some storms along the New Mexico border and significant MCSs in Mexico. 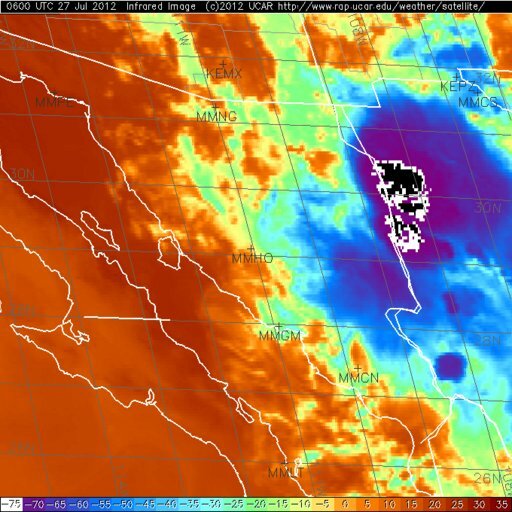 IR image above is from 06 UTC (27 July 2012) and shows very cold cloud-tops with the MCS over western Chihuahua. 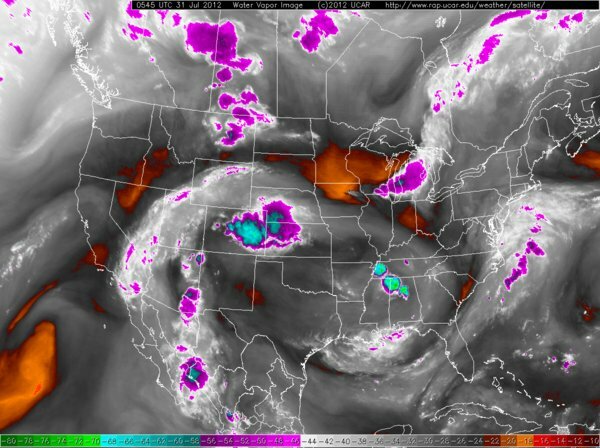 By 12 UTC (water vapor image below) the MCS was still active and had shifted westward into Sonora. Considerable debris cloud again this morning, along with some light sprinkles. 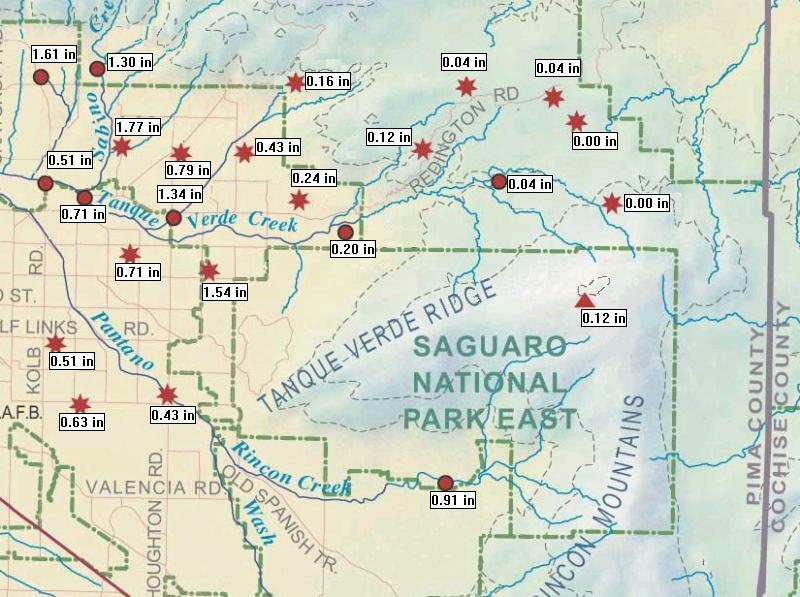 PW remains around 1.4" over parts of southeast Arizona (see GPS and RAOB time series above for U. of A) but falls to around an 1.00" across the southwestern part of the state. 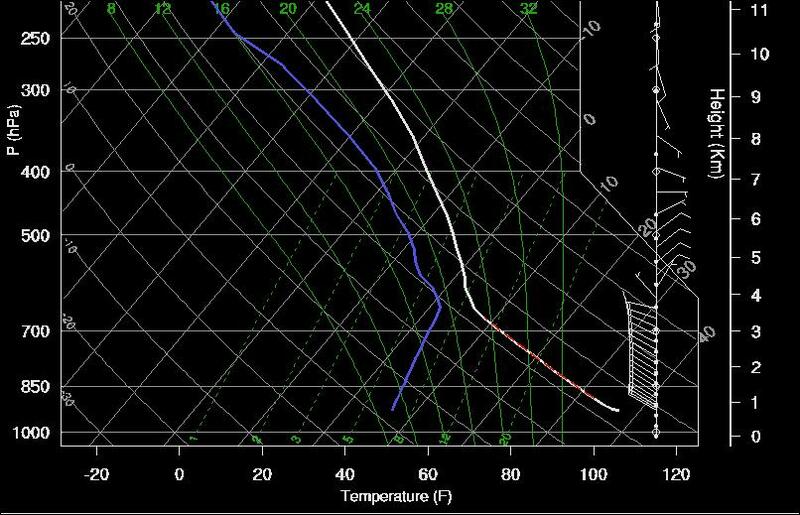 This morning's Tucson skewT plot (below) indicates: no CAPE unless low-level moisture increases; poorly organized and light winds except in upper-troposphere; and a temperature inversion just above 500 mb that may be stronger than the sounding data indicate. All-in-all a very chopped up atmosphere to begin the day. The models increase 500 mb winds by late afternoon, but it appears that moisture increases will have to come from moist outflows and recycling in the short-term. The early WRF-GFS forecasts morning thunderstorms that have not materialized. So, I'll wait to see the 12 UTC forecast runs. Yesterday was quite suppressed across Pima County, as per the WRF-GFS forecast. 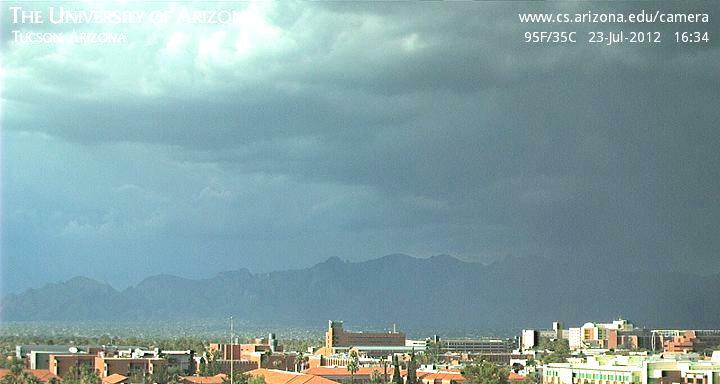 No deep convection and no rain, except in the distant mountains and along the borderlands of southeast Arizona. View above is of the Catalinas at 3 pm MST yesterday. This morning there is heavy debris cloud from Sonora drifting around. The Tucson morning sounding has little CAPE, but PW has recovered to around 1.5". Will things get better or worse during the day? The WRF-GFS, on the 5.4 km grid, forecast valid at 6 am is shown above for 850 mb Td. The dry air intrusion over western Pima County is a definite issue in the forecasts for today. It's scale is small enough that it is invisible to the upper-air network - so the first question is whether or not that dry air is really out there. GPS PW data (Sells and Organ Pipe) say yes and the sunrise dewpoint at Sells was only 47F, compared to low 60s here in the Tucson metro area. So, my answer is yes, that dry air is apparently lurking to our west, as per the model forecast. 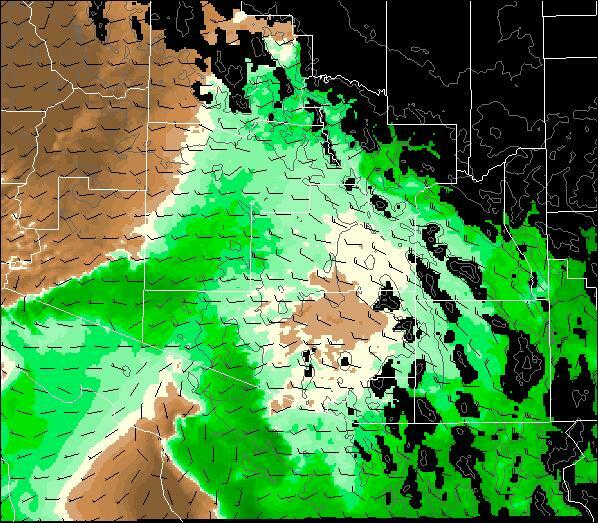 The WRF-GFS (on the 1.8 km grid) forecasts drying at 850 mb over eastern Pima County this afternoon. 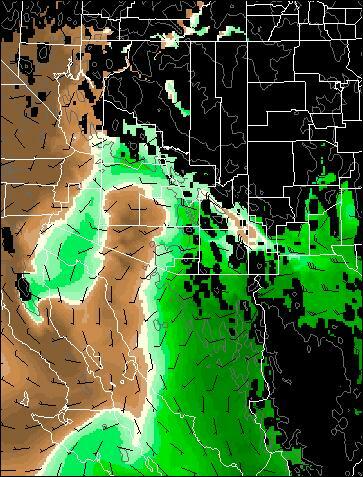 The net result of westerly winds below 700 mb in the model's forecast is a minimum amount of CAPE over southeast Arizona this afternoon (below is CAPE forecast valid at 5 pm MST). The model seems a bit too dry in its forecasts of PW this morning, so that would be the parameter to keep an eye on as the day progresses. The total rainfall forecast through midnight tonight (below) indicates only some sprinkles and spits, with meaningful amounts in the Rim country and south of the border. Should be an interesting day to watch how the model does - also definitely a day to take a close look at the 12 UTC runs from Atmo. The early run of Atmo's high-resolution version of the WRF-GFS model this morning forecasts a complete shutdown of deep convection over Pima County this afternoon. The model forecasted the low-level dry intrusions yesterday (both from west and from south) into southwestern Arizona. Today's run continues the downward trend of 850 mb Td (above) and PW (below), both valid at 5 pm MST. Although a couple of bands of higher moisture remain to the west, the model forecasts no deep convection in the bands. 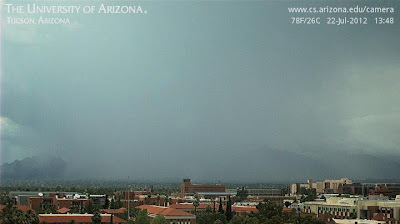 The forecast skewT for Tucson at 5 pm (below) indicates a deep and dry boundary layer with no CAPE. Westerly winds prevail up to almost 600 mb. It looks like a definite down couple of days for the Tucson area. However, with no rain here at house for 3 days I had to go out and water plants that are in pots yesterday afternoon. Few more storms around eastern Pima County yesterday afternoon. 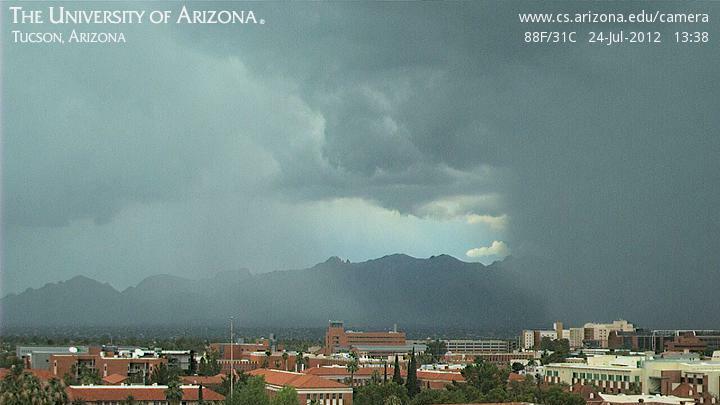 Heavily raining storm over east foothills of the Catalinas at 1:38 pm MST (above). Our house sits exactly between the two rain shafts. We had lots of thunder but only a trace of rain for third straight day. Areal cover across the ALERT network during past 24-hours was just over 50%, with the rains mostly in foothills and higher elevations. The east central portion of the network is shown below, where most amounts over half an inch fell, as well as the two amounts over an inch. Above from David Cristiani, showing some rain finally hitting his place in Albuquerque. Below is sunset shot from the house. Thunderstorm activity over eastern Pima County was considerably less yesterday than on Sunday. Storms were slow moving and around the edges of town. The storm above at 4:30 pm MST was one of several cells just to the east and northeast of the house. We had lots of lightning and thunder, with outflow gusts of 40 to 50 mph, but the rain remained nearly stationary. So another day with spits and a trace. Across the ALERT network only 31 sites had rainfall during past 24-hours. There were only 4 stations with a half inch or more and two of these had over an inch. This morning heavy cloud cover has moved in from the northwest and there are morning showers occurring between here and Phoenix. The morning Tucson sounding remains very wet and with potential for decent CAPE - appears there may be a bit of elevated CAPE present also. Almost no winds aloft again today. Remnants of the old 500 mb short-wave trough will hang over eastern Arizona today. 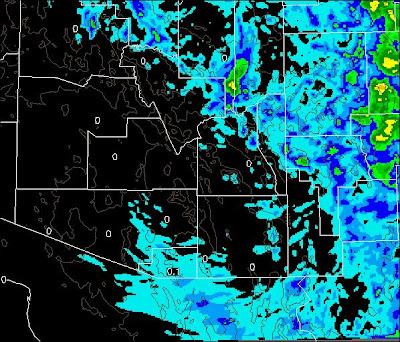 Looks like a tough day for the models - the NAM forecasts widespread rain across eastern and southeastern Arizona from now through noon and then increases amounts and coverage in the afternoon. The early WRF-GFS forecast doesn't have the cloud cover initialized right and it forecasts widespread showers and storms in the afternoon. Both models focus on the east as drier and warmer air eases in from the west. The graphic below is WRF-GFS rainfall through midnight tonight. Sunday was the second day in a row with early storms, followed by a suppressed late afternoon and evening with heavy anvils and debris cloud. Here at the house we had thunder around 2 pm with a few spits of rain - total for day a trace. 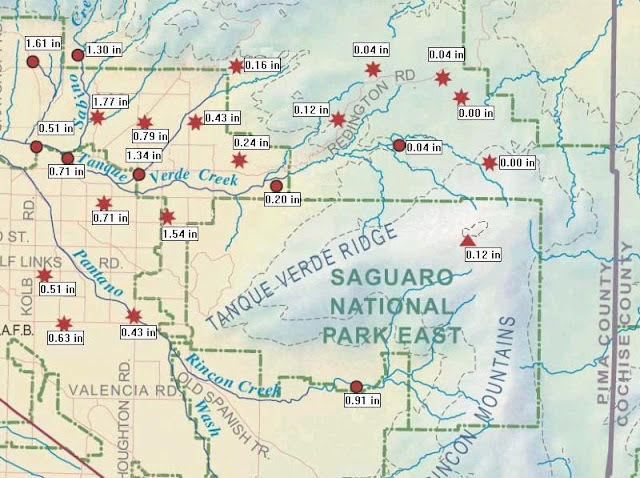 In fact the storm and rain activity in eastern Pima County shifted to higher elevations around the edges of the network. 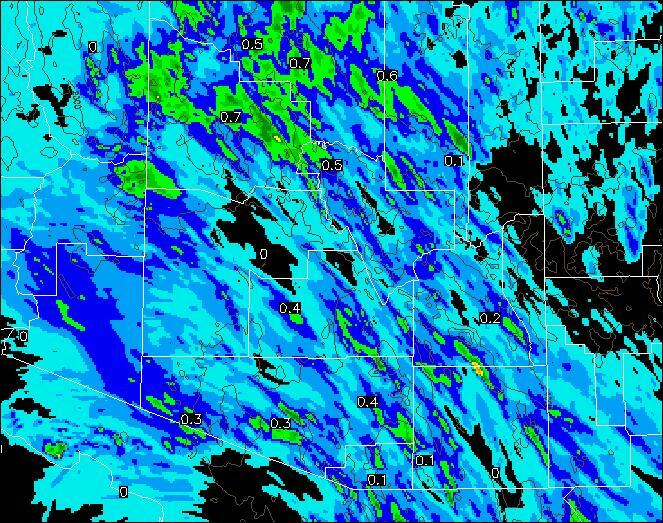 Rainfall during the past 24-hours is shown above for the central and western part of the network. 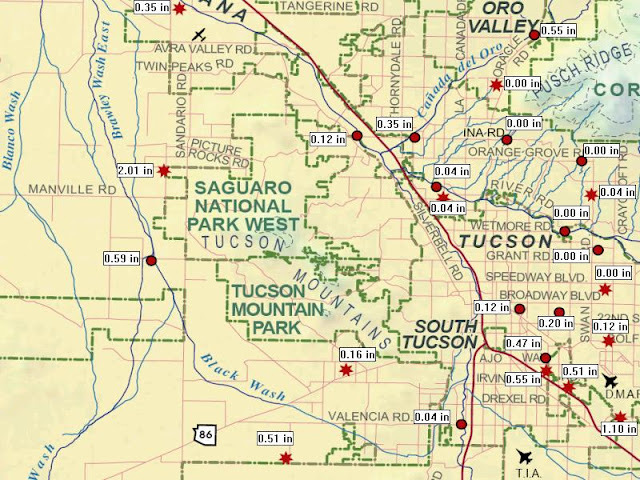 The central metro region of Tucson had very little rain (coverage only 30%), while the entire network had about 70% coverage. The 0.43" at east end of Orange Grove was produced by the storm shown in previous post. 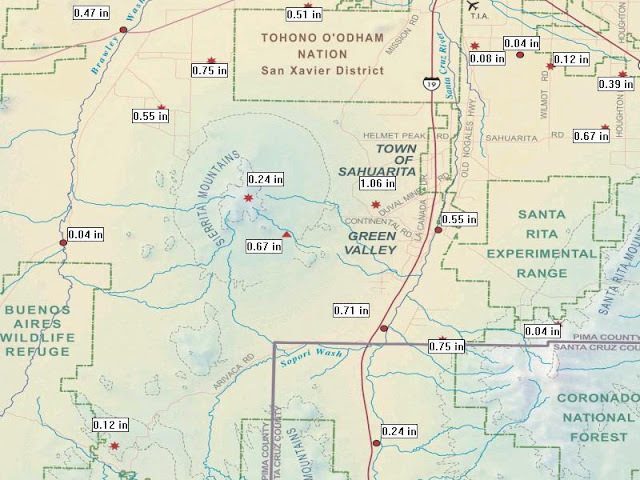 Across the network 9 sites recorded more than 1/2 inch and 1 site in the Catalinas had just over an inch. feature has morphed into a weak short-wave, open to the north, that comes back toward the east tomorrow, visiting our part of the state for the second time. 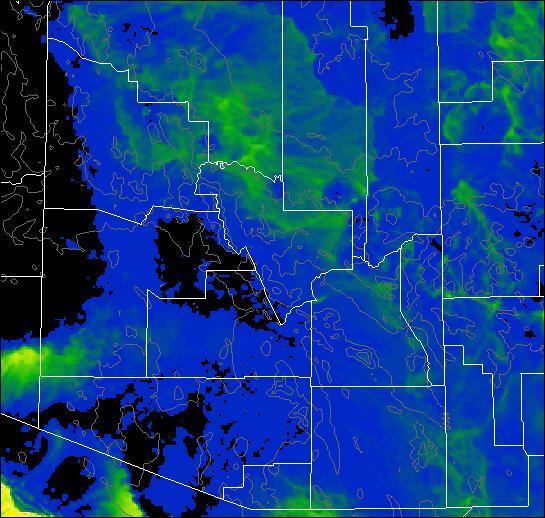 The early WRF-GFS forecast of composite radar valid at 3 pm this afternoon is shown above - note the big hole over central Tucson. The total rainfall forecast through midnight tonight (below) also shows a large minimum rain area across central Tucson. I think that local point forecasts for rainfall for today will be very difficult, since much will depend upon where first storms form, and then on which way they propagate. Heavy thunderstorms are moving north this afternoon. Only thunder and spits here at house. 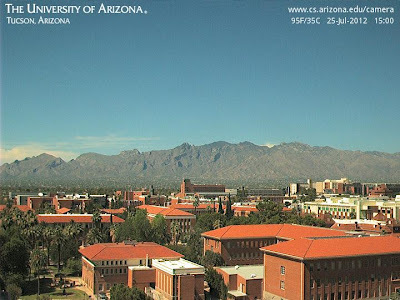 But two images above are: top - view north from campus at 1:45 pm MST; just above is 2 pm view south from Kit Peak web cam. Below is 2 pm TUS radar composite image. Skies partly cleared fairly quickly yesterday (Saturday, 21 July 2012) and storms rapidly developed across the metro area around by 2 pm. The storms quickly organized into a large bow and sped off toward the west and northwest - above is Phoenix radar composite at about 3:30 pm MST. The storm left behind thick, trailing anvil, which basically shut things down for rest of the afternoon . There was limited activity to the east until late in the night. Rain amounts were more scattered than on Friday - 53 stations in the ALERT network had rainfall with 6 stations with a half inch or more. here at house there was 0.04", TUS had a trace, DM AFB reports 0.29" - Atmo station seems to have problems with yesterday's amount still showing for Saturday but with the plot indicating 0.10". The weakening storms raced into Phoenix around 6 pm with thick, blowing dust (Sky Harbor and Scottsdale airports both gusted to 51 mph). Rain was mostly spits and light showers however. An aside, the Vaisala RS-92 GPS sonde used at Phoenix is tracking very close to GPS PW measurements this week (below). This morning there are heavy clouds and light sprinkles over the Tucson area and much of Arizona. (6:30 am MST visible satellite image above). The morning Tucson sounding (below) is very wet, with a bit less CAPE than yesterday due to warm, middle-level temperatures. Still an unstable sounding with potential for heavy local rain and wet microbursts. Key question is how much sunshine will materialize by afternoon - clouds appear heavier than yesterday. Also an issue is whether storms will develop off to the east today. The middle-level IT is gradually weakening as it moves slowly westward. Upper-levels have a weak deformation zone from overhead into west Texas. Sunshine and local forcing will play a large role in determining events this afternoon. Morning NAM forecasts an active day over all of southern Arizona. Atmo WRF-GFS again not available this morning. Yesterday ended up producing a nice storm and rain event across the Tucson metro area. 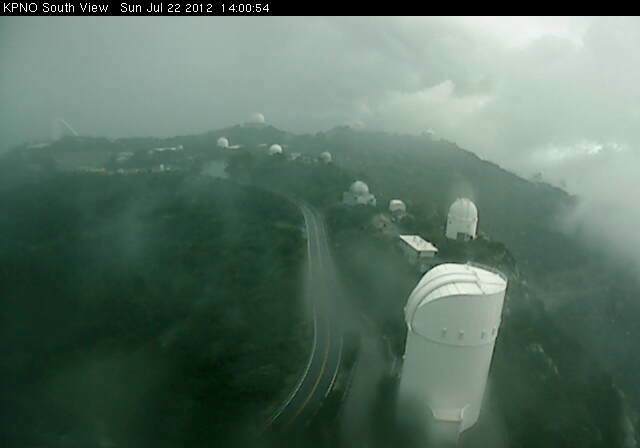 Here at house the first storms built south off the Catalinas around 5 pm. These were followed by a couple of lighter showers at dusk. Total here at house was 0.40". 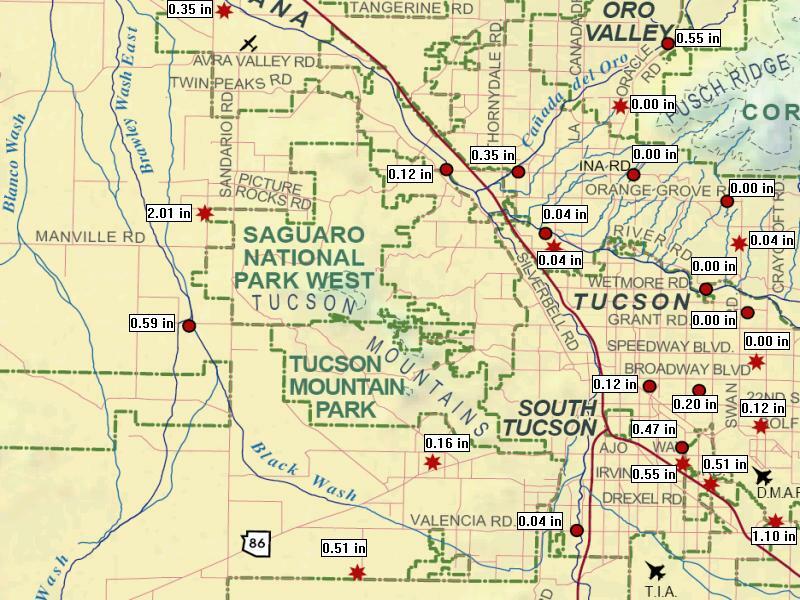 TUS recorded 0.56" and Atmo had 0.79 (this was the highest amount I noted in the Tucsons area), while DM AFB had only 0.19". 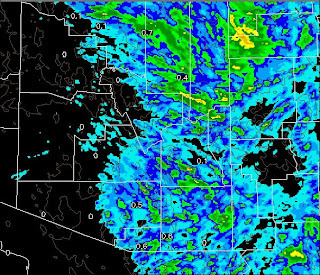 Rain was recorded at 86 of the 93 ALERT sites (>90% areal coverage with most of it falling before 9 pm MST). Amounts were not heavy with only three stations recording just over half an inch. Forecasts were under-done yesterday, with considerably more convection and rainfall than anticipated. The early WRF-GFS did not predict the increase of PW that occurred steadily through the day yesterday (see above GPS time series with amounts rising to 1.8" during the storms). The noon sounding was considerably more favorable for storms than had been the morning sounding, especially when one considered the additional PW indicated by GPS - see previous post below. How Goes It At 5 PM? Which Version Of WRF Has It Right?